We had dinner at A Valenciana Restaurante in Lisbon. The front of the restaurant was for customers while the back of the restaurant catered to tour groups. 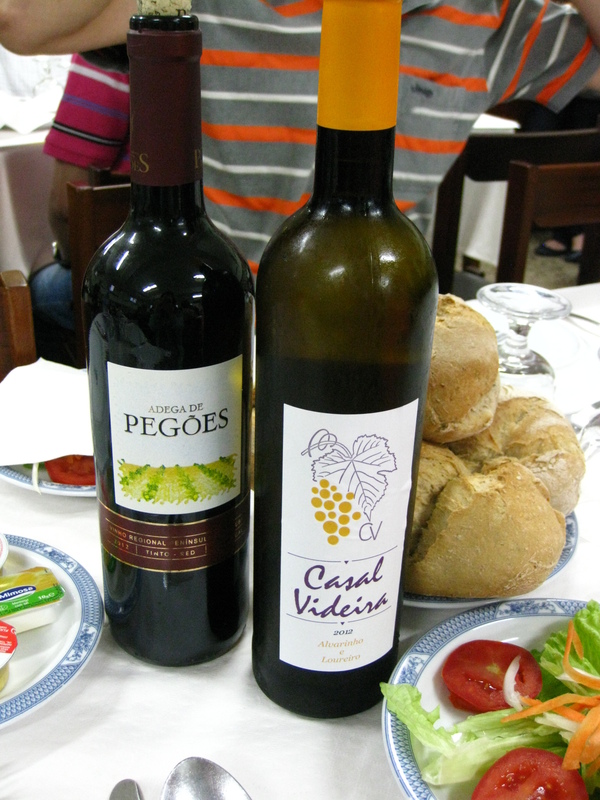 We were given a bottle of red wine (Adega de Pegoes) and a bottle of white wine (Casal Videira) along with a plate of bread, sardine pate and butter. 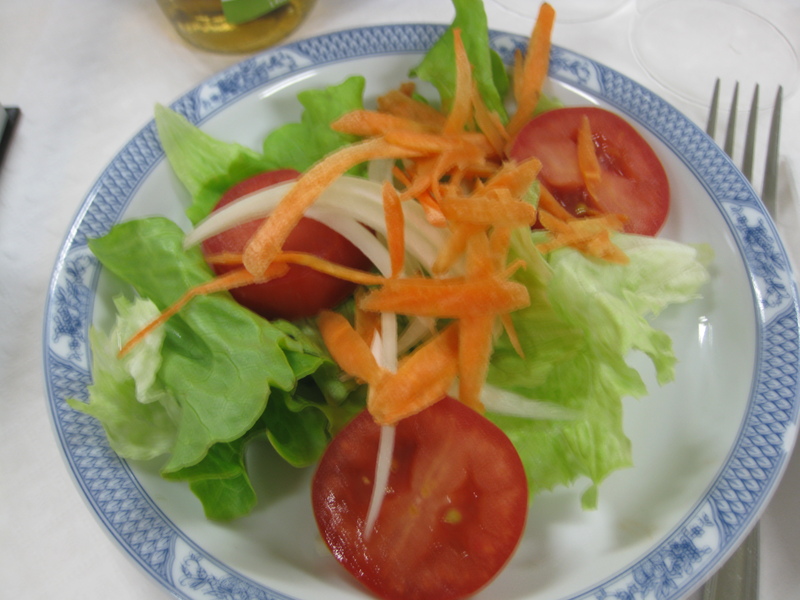 The starters were vegetable soup and tomato, carrot, onion and lettuce salad. 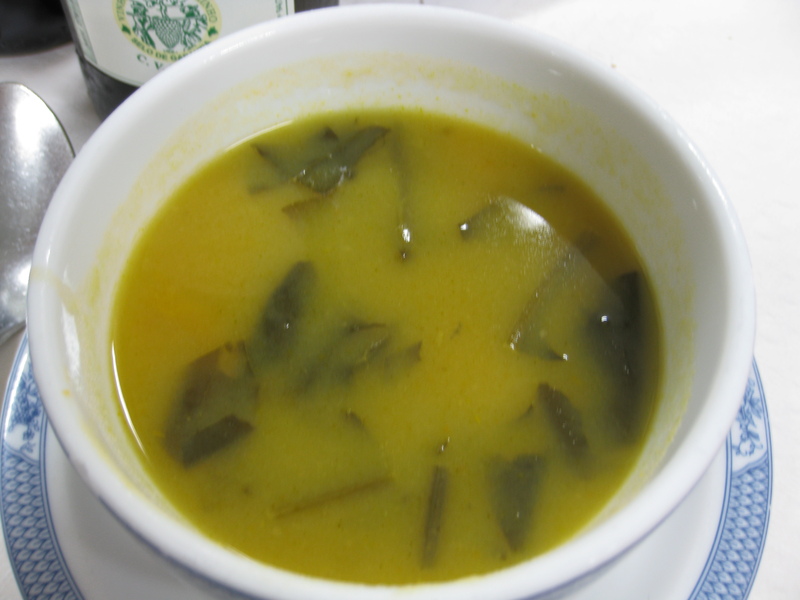 The vegetable soup was quite good. The sardine pate goes very well with the salad. 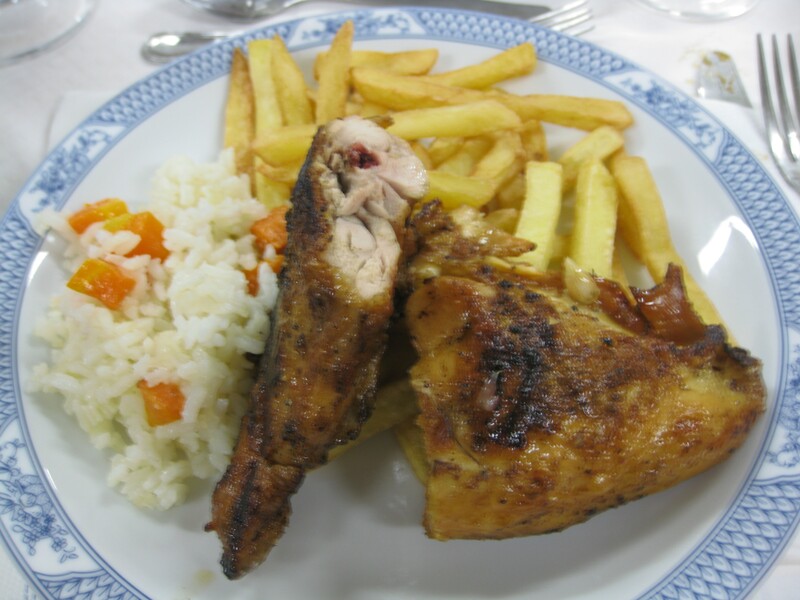 The main was rotisserie chicken with piri-piri sauce, fries and rice with carrots. I didn’t find the piri-piri sauce to be spicy however the rotisserie chicken was absolutely delicious. It is as good as the rotisserie chicken I had at Ramados in Montreal. 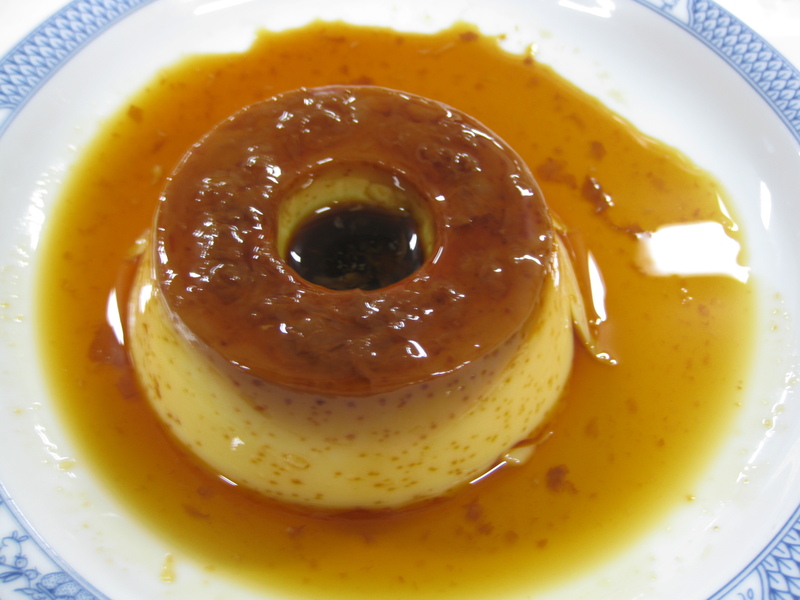 The dessert is creme caramel. It was scrumptious. Overall, I recommend eating at A Valenciana Restaurante for the rotisserie chicken. We had lunch at Fatima at a restaurant called Restaurante O Recinto. The way the tables were arranged reminded me of a cafeteria. 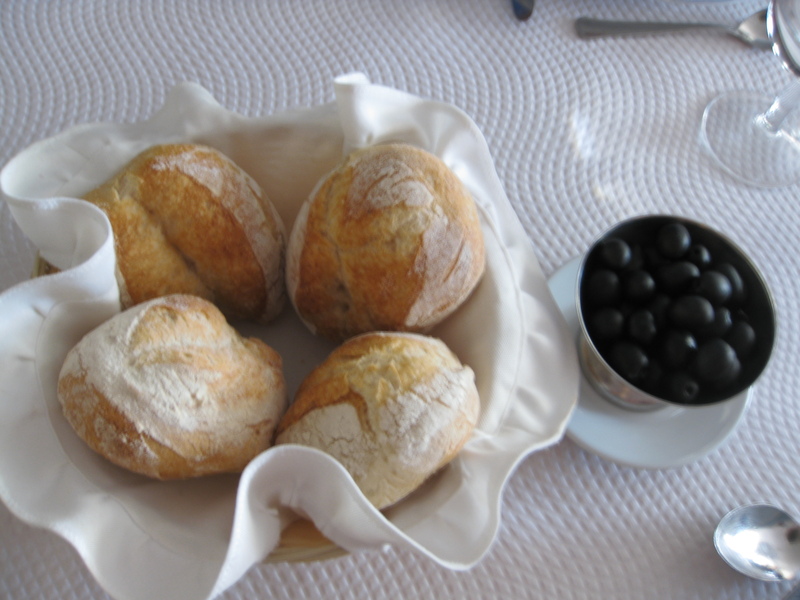 We were given water, bread and olives when we first sat down. 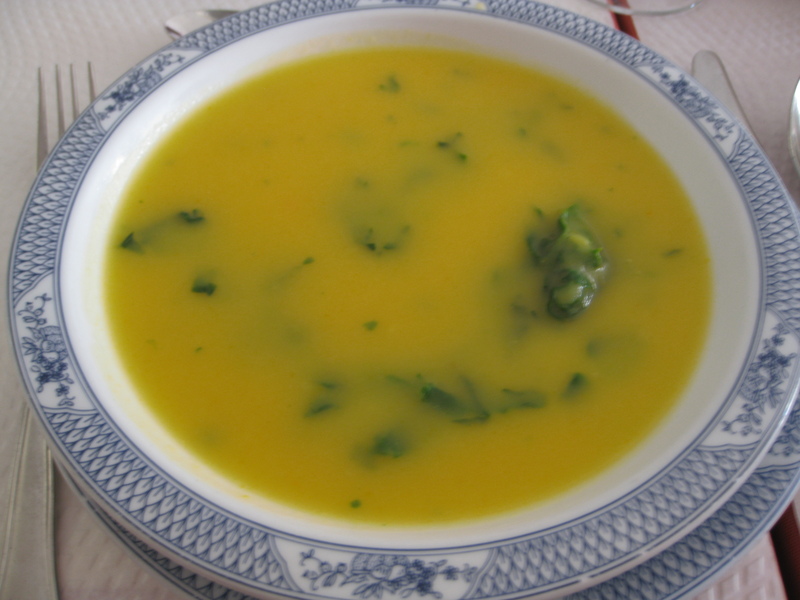 The starter was vegetable soup.It was quite good although some people found it slightly salty. 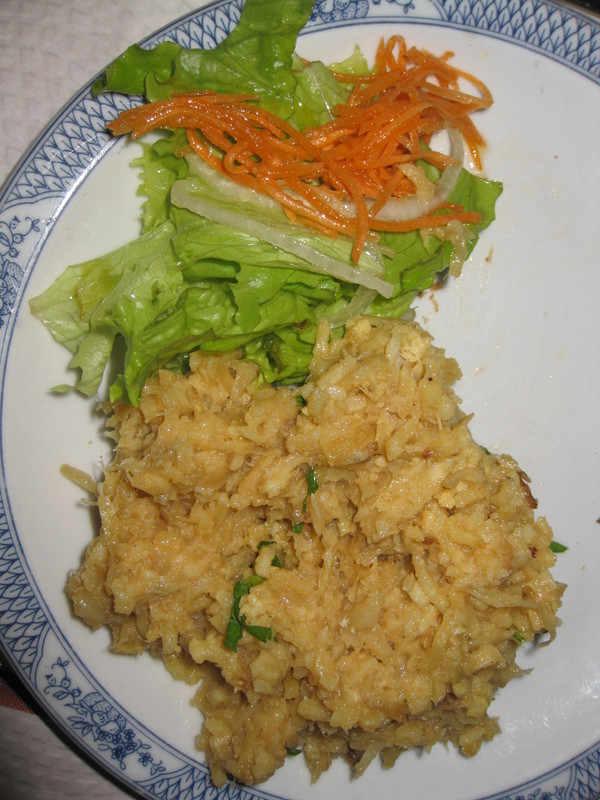 The main dish was bacalhau mixed with rice and olives and served with a side of carrot and lettuce salad. The bacalhau was salty but flavourful. For dessert there was orange flavour pudding. It was fairly sweet. I joined GoGo Tours on their 11 day Portugal-Gibraltar-Spain tour during the month of May. The places the tour visits in Portugal are Lisbon, Obidos, Fatima, Cabo da Roca and Cascais. The places the tour visits in Spain are Seville, Mijas, Torremolinos, Cordoba, Granada, Consuegra, Toledo, Madrid, Zaragoza and Barcelona. 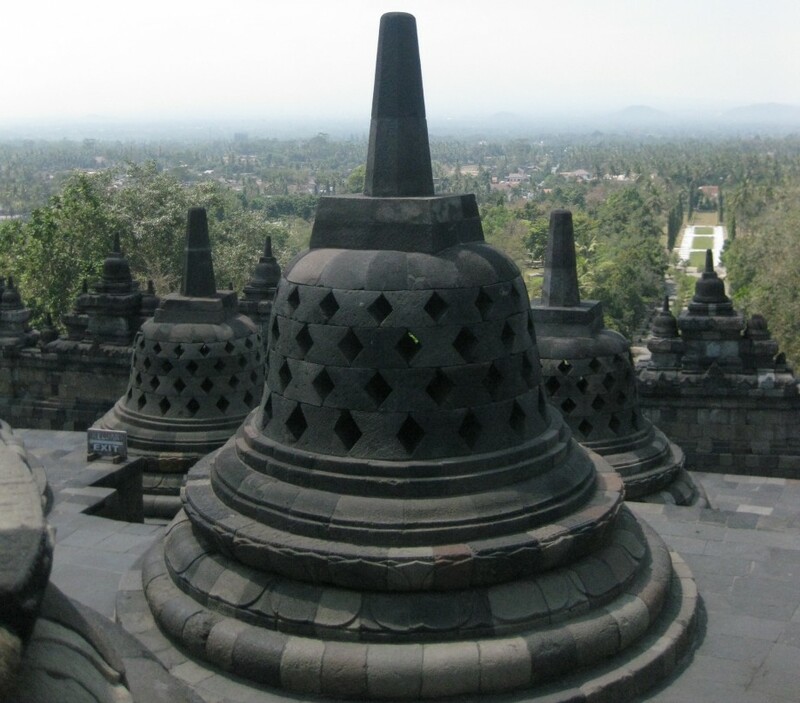 The tour includes round trip flights, most meals, accommodations at 4 star hotels, transportation, tour guides and admission to most attractions. The main reason I joined a tour to travel around Portugal and Spain is due to the prevalence of pickpocketers. The tour has a cap of 38 people. Even if the European bus company provides a bigger bus (45 seats or 50 seats), GoGo Tours would still have a cap of 38 people on the tour even if there is a waiting list. The dates for the 11 day Spain-Portugal tour were either in May or in September which are the best times to visit the Iberian Peninsula. We flew on Lufthansa Airways. The plane used to fly between Toronto and Frankfurt reminded me of the planes used by American flights to Asia. I think the particular plane we were on was the Boeing 737. The leg room is virtually non-existent. When the person in front of you reclines while you’re sitting in the upright position, the tv screen is basically right in your face. When the tray is down, it basically reaches to where the seat/armrests ends, provided that the seat in front of you is not reclined. I find that inconsiderate seat neighbours really make any kind of flight a nightmare. I was unfortunate to sit behind an inconsiderate rich heavyset boy on my flight to Frankfurt. His argument to me when I politely asked him to move his reclined seat to an upright position so I can actually stand and get out of my aisle seat was that “I paid for this flight so stop bothering me!”. My first thought was are you a toddler or a five year old child; your argument is unsound in that most people on the airplane pay for their seats too and everybody in economy class is in the same situation with the non-existent legroom so a little compassion and/or understanding that your plight is similar to my plight would help make the flight more bearable for everybody. Just cause you need your space doesn’t mean that nobody else needs their space too. On top of that I think he was with a Chinese Christian tour so it gives Christians and Chinese people a bad rep since it only takes a bad apple to affect the entire bushel. Needless to say, I was overjoyed when the plane landed. On my flight back, I was surrounded by my fellow tour-goers so it was an extremely pleasant flight back since we all didn’t recline our seats making the non-existent leg room bearable. There were courteous people on that particular flight from Frankfurt to Toronto as well since a guy who had an aisle seat was willing to trade for a different aisle seat (on the other side of the plane and further back compared to his first seat) so that a couple can sit together. I prefer the short haul Lufthansa flights since it reminds me of Tiger Airways, Air Asia and Jetstar. The plane has leather seats and it sits 6 people across (3 seats on either side of the aisle) compared to the 10 people across for the Boeing 737 (3 seats, aisle, 4 seats, aisle, 3 seats). It also has lots of legroom in comparison. The food served by Lufthansa is alright. We stayed at the Radisson Blu for 2 nights in Lisbon. This is quite the luxury hotel. For breakfast, there is a variety of cheese including brie and gouda, cold meats, bread and pastries and there is also smoked salmon. 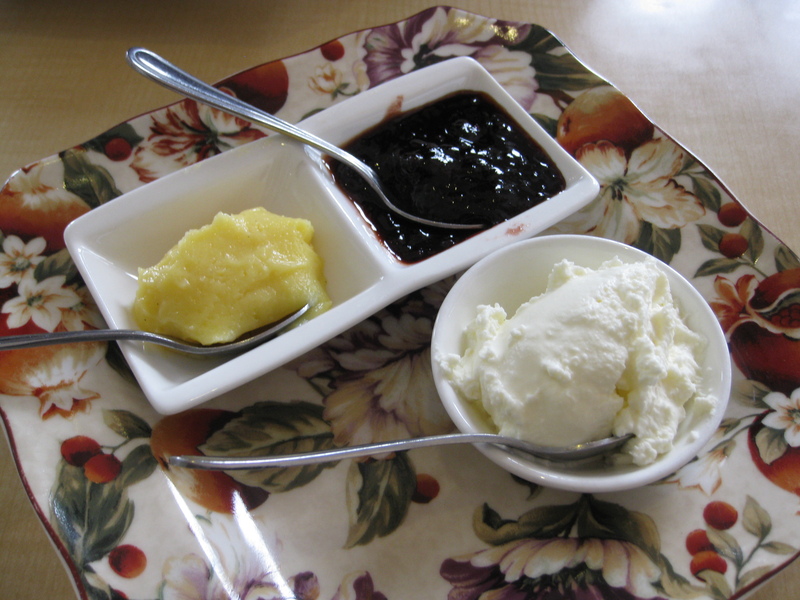 The jams and honey were in tiny glass jars reminiscent of the ones served at afternoon teas. There is a kettle in the room as well. The only times we had a kettle in the hotel room were at Radisson Blu and at the Senator hotel in Barcelona. The wifi is free at Radisson Blu. We stayed at the Vertice hotel in Seville for a night. The decor is quite modern at this hotel although the room is smaller compared to the one at Radisson Blu. The wifi is free at this hotel as well. We stayed at the Cervantes Hotel in Torremolinos for a night. Their breakfast and dinner buffets are quite good and have a huge variety. The dinner buffet has paella, savoury crepes, gazpacho soup, freshly made pasta in which you pick the ingredients and the chef cooks it right in front of you, freshly baked pizza (you get a whole pizza rather than a slice of pizza), and a variety of desserts including pumpkin flan, among many other food options. The breakfast buffet has pancakes, eggs fried right in front of you, a variety of cheese and chaucuterie, among other food options. There is no free wifi at this hotel. We stayed at the Macia Real Alhambra hotel in Granada for a night. There is free wifi but only one device is allowed internet per room. There were 4 kinds of pate at breakfast. Pate Iberico Pedro Ximenez con Pasas, Pate Iberico, Zurrapa de Lomo and Crema de Queso. I liked the Pate Iberico Pedro Ximenez con Pasas and Pate Iberico the most. We stayed at the Barcelo Torre Arias hotel in Marid for 2 nights. The bathroom is very modern. I had never seen a bathroom with a very sophisticated showerhead before. There is free wifi at this hotel. The breakfast at the hotel also serves jam and honey in tiny glass jars like at Radisson Blu along with this delicious coconut pastry. We stayed at the Senator hotel in Barcelona for 2 nights. Apparently the water and Coke bottles were free of charge and there is a kettle to boil water. The wifi is free at this hotel as well. The Senator Barcelona SPA hotel is walking distance of the FC Barcelona stadium, Camp Nou. The breakfast for tour groups is one of the worst I’ve experienced for a four star hotel. There is lukewarm eggs and bacon, afew plates of cheese and chacuterie and 3 different kinds of bread/pastries. There is a total of 17 meals (lunch and dinner) during the trip. Out of the 17 meals, one of them is not included in the initial tour price. This is the dinner in Seville in which you have the optional tour of dinner and flamingo show which costs 70€. There are also 5 Chinese/Asian meals. The first dinner in Lisbon was Chinese. 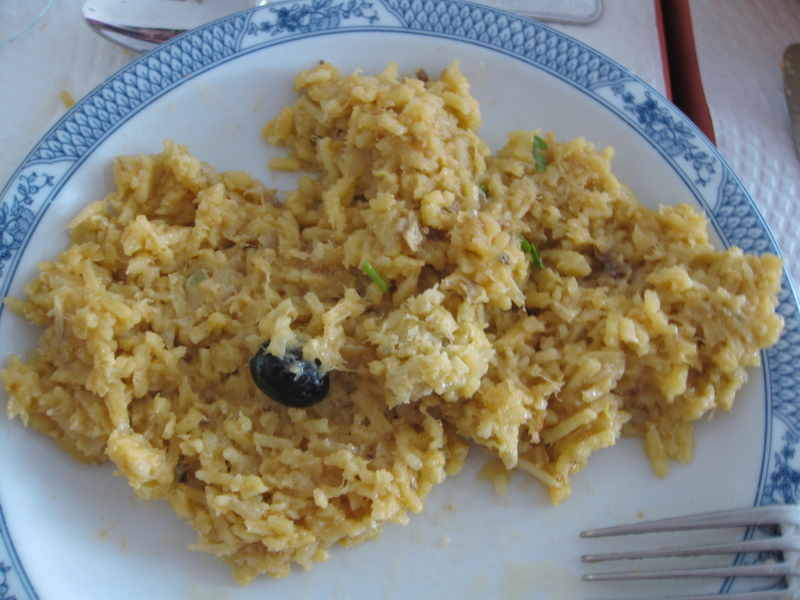 Lunch at Fatima was bacalhau. Dinner in Lisbon was Portuguese rotisserie chicken. Lunch at Seville was Western. Lunch at Gibraltar was fish and chips. Dinner at Torremolinos was Western buffet at the hotel. Lunch at Cordoba was Western. Dinner at Granada was Western. Lunch at Toledo was paella with sangria. Dinner at Madrid was Chinese. It was the first time I ate at a Chinese restaurant in Europe in which the quality is similar to most of the Chinese restaurants in Toronto. There is legit Chinese food in Madrid at a restaurant called Alta Cocina Oriental City Garden. Lunch in Madrid was tapas. Dinner in Madrid was Spanish roasted suckling pig. Lunch at Zaragoza was tapas buffet at a restaurant called Las Palomas Buffet & Tapas. We were served lunch with a bottle of red wine (Villalta Vendimia Seleccionada Carinena). The buffet selection includes paella, calamari, seafood noodles, sausages, tomatoe slices with feata cheese, mussels, chocolate pudding, natella and chocolate fountain. The cost of the lunch buffet is 14.95€. Dinner in Barcelona was Chinese at a restaurant with 40 years of history called Restaurant Chino Rio Azul. The chef there is Taiwanese so the food was alright. Lunch in Barcelona was Chinese at a restaurant called Restaurante Shanghai 1930. What is unique about this restaurant is that some of their decor is reminiscent of the mosaics at Park Güell so it’s Gaudi inspired decor. Dinner in Barcelona was at a restaurant called Restaurante Japones Wok Arc de Triomf. It’s a Japanese/Chinese buffet with a grill and a teppenyaki, a variety of meats and seafood, a variety of sushi rolls and sushi, some Chinese food and mediocre Spanish dessert. 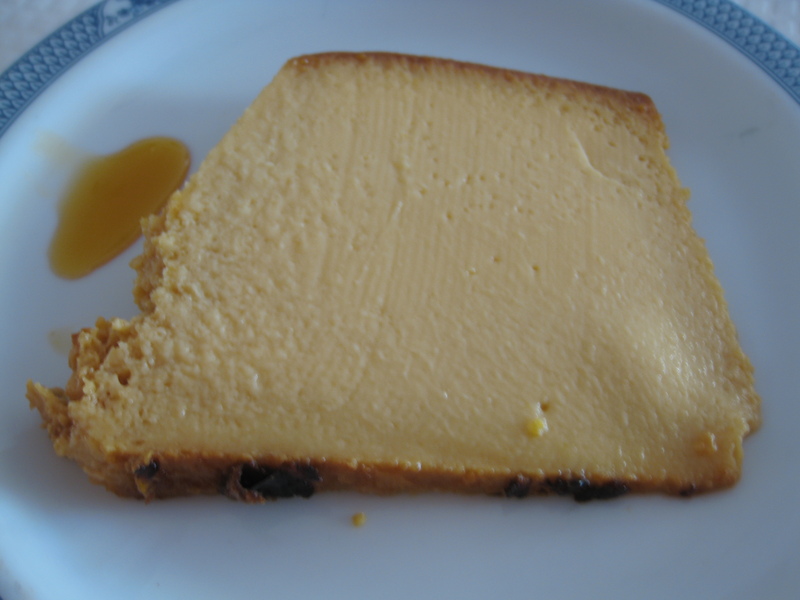 The flan and natella there was completely tasteless. The sushi and sushi rolls are mediocre. The meats and seafood cooked via the grill or teppenyaki were mediocre to ok depending on the quality of the seafood and meat. Overall, it was the most disappointing dinner of the entire trip. Overall, I was happy with my trip to Portugal, Gibraltar and Spain with GoGo Tours. The accommodations and breakfasts were quite nice on average. The restaurants we went to served fairly delicious food on average with a few notable exceptions. The cost of the tour including discounts, tax & fuel surcharge, mandatory gratuities, the Seville dinner and flamingo show and admission fees to the Grand Palace (35€) and Casa Mila (20€) is less than $3300 Canadian. If you wanted to travel with a tour to the Iberian Peninsula then I recommend using GoGo Tours. I had dinner at Sun’s Kitchen again last night. This time I got the dan dan noodles ($6.75 including tax). 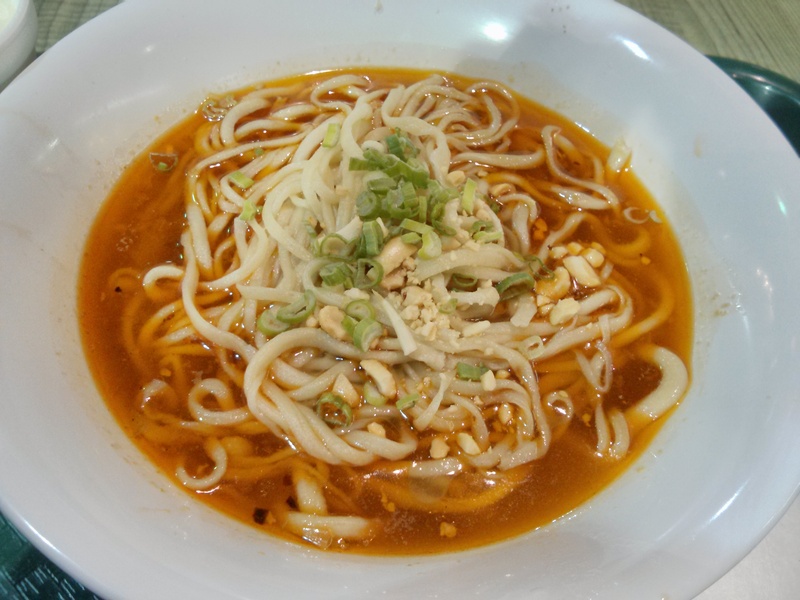 It’s basically handmade la mian in a spicy broth topped with peanuts and green onions. The broth was quite spicy, compared to other places I’ve been to. I wished that there were more toppings to this dish so that it would be more tasty. The portion size was quite large. Overall, it was ok. While wandering around Eaton Center my friend and I were deciding on a place to have dinner. My friend suggested W Burger Bar and we immediately made reservations there considering that it was 7pm on a Saturday night. We were able to get a call back within minutes considering that we thought we could meander our way there. At first we sat at the bar while waiting for a table to be readied. Once we were seated, my friend had to deal with my indecisiveness between ordering a bison burger or a beef burger. In the end I got the bison burger. 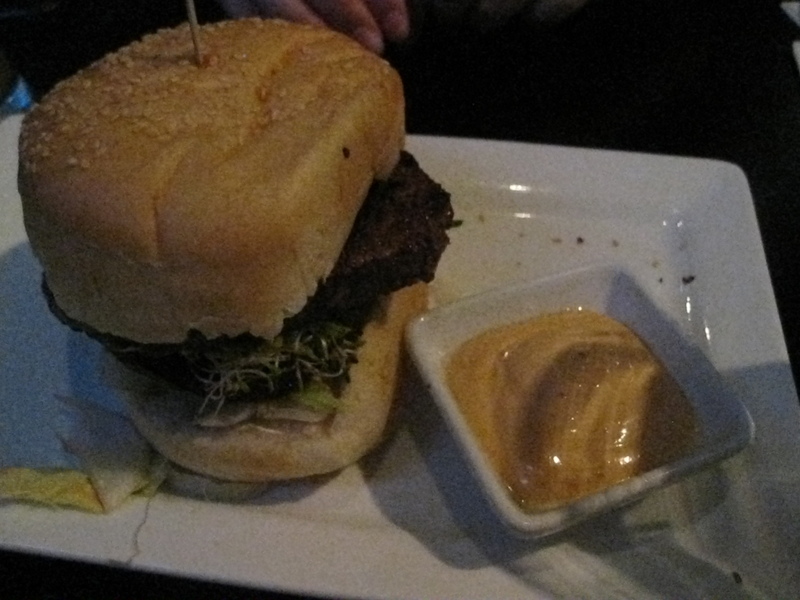 My friend had the beef burger with beets, alfalfa sprouts and other toppings along with chipotle mayo on the side. 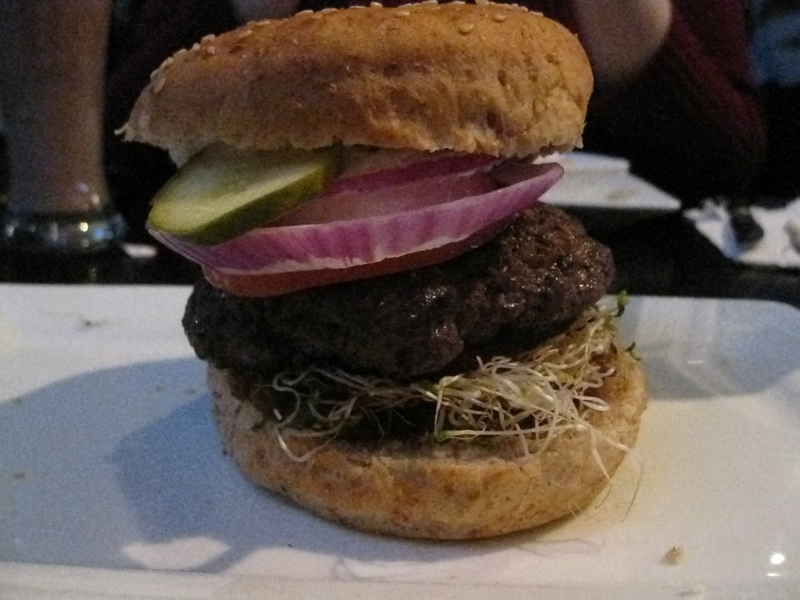 I had the bison burger with beets, alfalfa sprouts, tomatoes, sauteed onions, red onions, pickles, lettuce, 1 jalapeno, tzatziki sauce, garlic herb mayonnaise, cilantro yoghurt and chipoltle mustard. It was a tower in comparison to my friend’s burger. It was absolutely deliciously amazing. 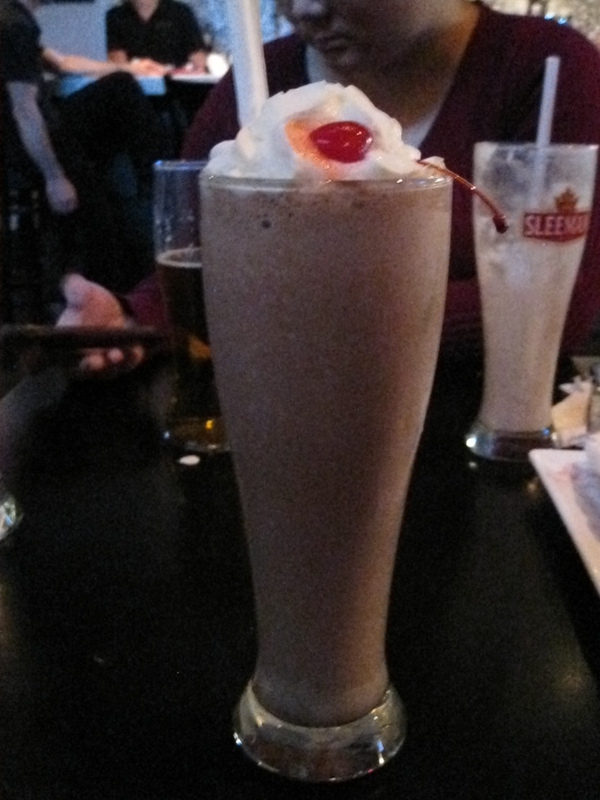 I also had the Nutty Professor, a spiked milkshake. Originally it comes with vanilla ice cream however I substituted it with chocolate ice cream and it’s delectable. Overall, for a gourmet burger in downtown Toronto, this is now my go-to place. 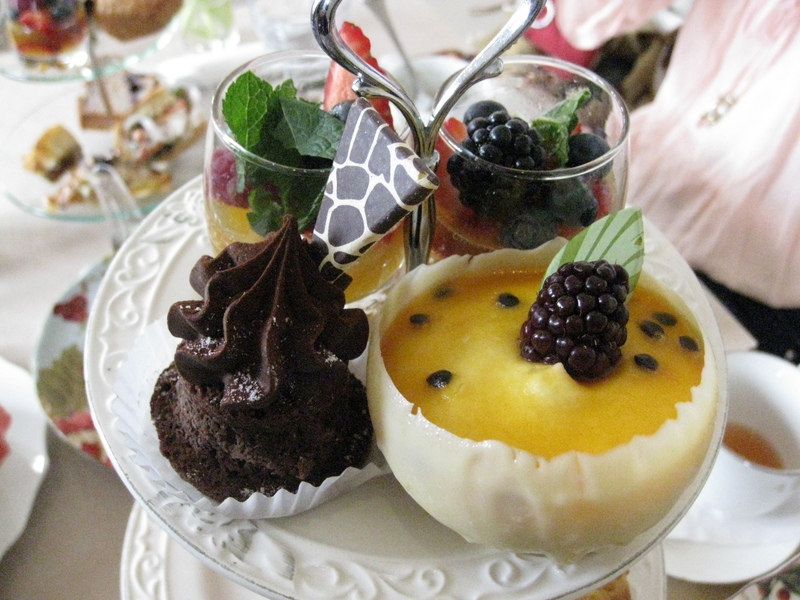 Two of my university friends and I decided to go for afternoon tea this past Saturday. We decided on DT Bistro because it was affordable, in terms of high tea, at $28 + tax & tip per person and it was downtown. DT Bistro is quite lovely, airy and modern in terms of their decor. It’s not as hard to find as I first thought it may be considering that I’m slightly unfamiliar with the west side of downtown. It was in a really quaint looking white house. 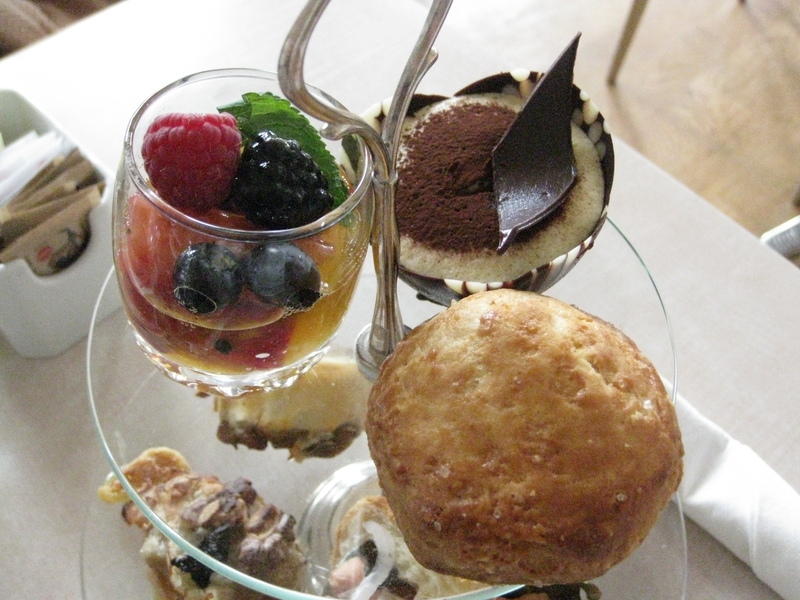 The afternoon tea consists of a choice of daily soup or vegetable spring rolls, a choice of tea, scones, pound cake, roasted pear and brie cheese on baguette, smoked salmon in mini croissant, mushroom strudel and dessert. My friends and I decided to get the blood orange tea and the English Delight tea. 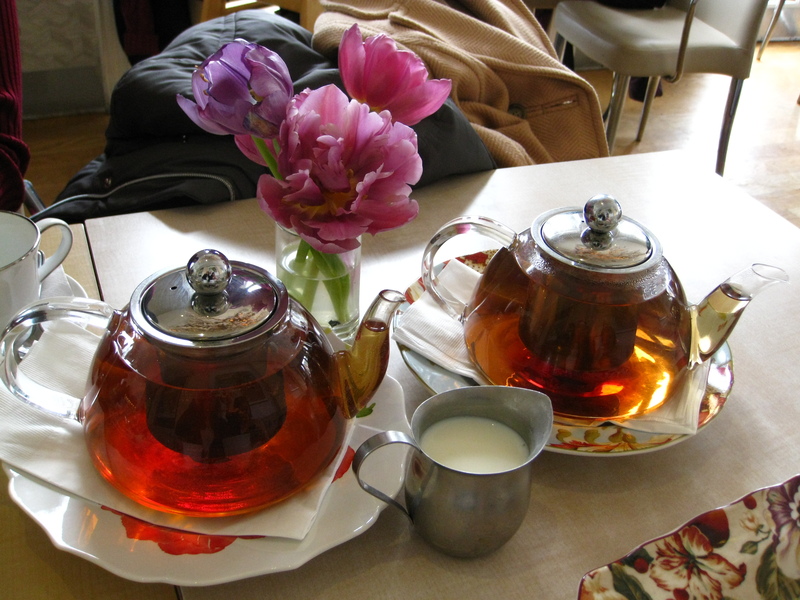 We were able to get two pots of tea because it’s two people per teapot. What I like best at Windsor Arms is that each person gets to choose which tea they want rather than have to potentially compromise on the tea. The blood orange tea is quite strong for a fruity tea. I enjoyed the English Delight tea which is a blend of Assam Ceylon and Chinese green tea. I was also interested in the Chai Wallah tea however there’s always a next time. My friends and I decided to all get the mushroom soup. 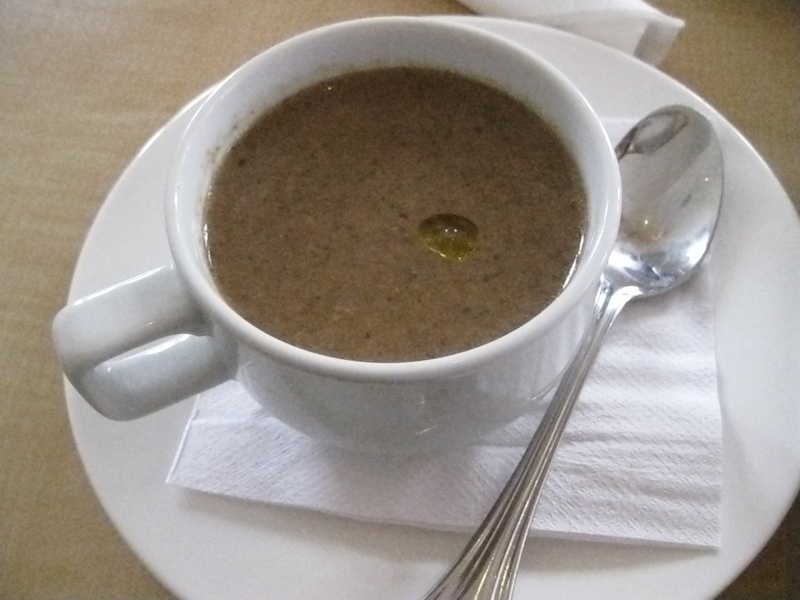 The mushroom soup was absolutely delicious. It’s made with wild mushrooms and infused with truffle oil. It reminded me of organic mushroom soup. The roasted pear and brie cheese on baguette is garnished with balsamic onion, black olives and walnuts. My friends and I loved it. The smoked salmon on mini croissant is garnished with lettuce, fennel pickle and sour cream. My friends and I loved it. The mushroom strudel is mushrooms wrapped in a pastry. It was good however I prefer the baguette and croissant more. 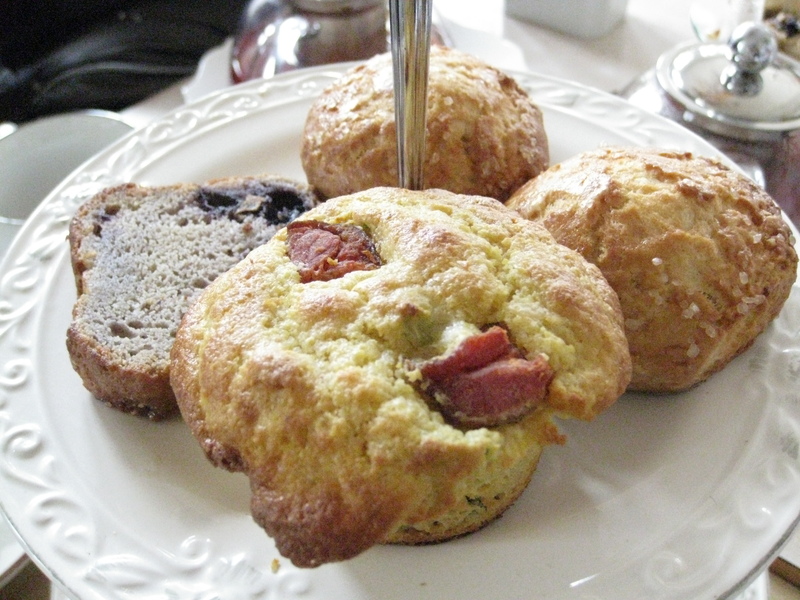 The scones and pound cake are served with lemon curd, berry jam and Devonshire cream. We were also given a cornbread and bacon cupcake. The scones were good, they were fluffy on the inside. The pound cake was alright albeit putting berry jam on it made it taste better. The cornbread and bacon cupcake surprisingly works although it is slightly too salty for my tastes. My friend and I found putting Devonshire cream on it helps. We were given a mini tiramisu cake, a mini passionfruit cake and a mini chocolate brownie with chocolate mousse. I had the passionfruit cake and it was scrumptious. We were also given a shot glass of fruits in either mango and/or guava nector. My friends thought that it was slightly too sweet for them. 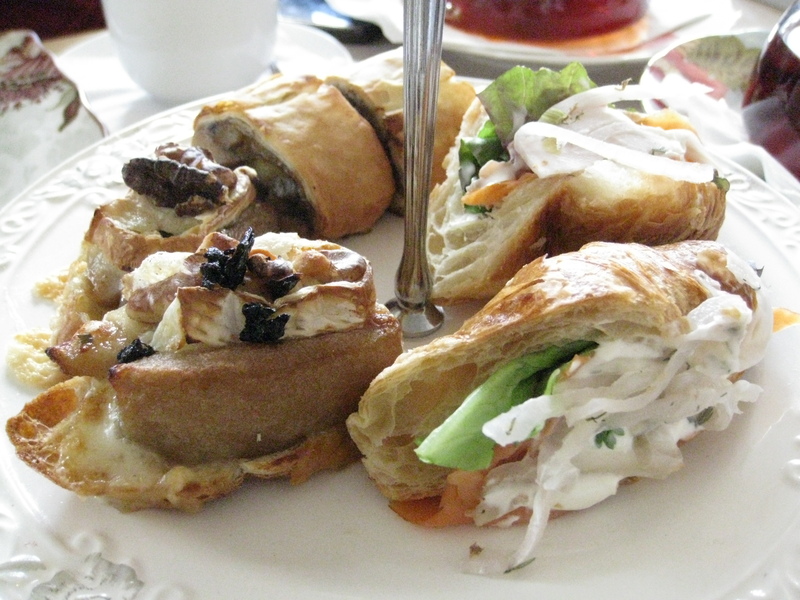 Overall, if you’re downtown and wanting to high tea without having to pay an arm and a leg, DT Bistro is a great place.